A gift from the Hon Frederick Smyth, a former NH governor and Candia native. 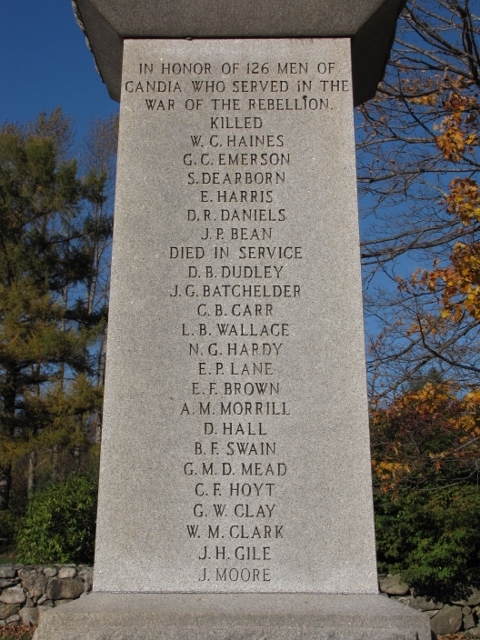 It was dedicated on Friday, 13 Oct 1893, in a large ceremony, with the members of numerous GAR posts, veteran associations, and state militia units marching in. 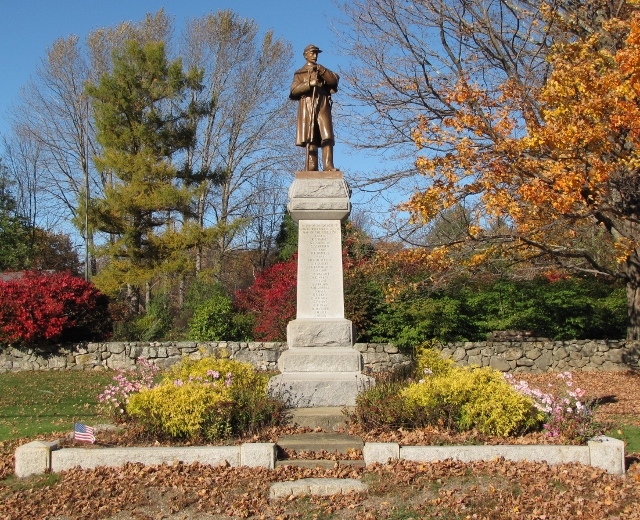 It was erected on land where the town's meeting house once stood. 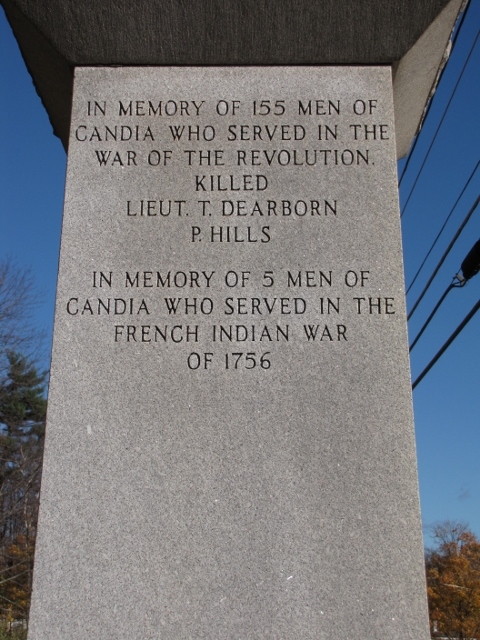 While the bronze figure is that of a Civil War soldier, the monument is representative of all of Candia's soldiers. The above inscriptions have been added to over the years, as evidenced by the original listing (on right), taken from the 1894 published book about the dedication (on Google Books). A re-dedication took place in 1958, at which time the granite stand was supposedly replaced. Considering the way the order of the soldiers' names have been changed, this was a likely occurrence. Wells C Haines (or Haynes), Cpl, Co B, 2nd NH Inf. Wounded and taken prisoner at Bull Run on 21 July 1861, he died from the wounds on 8 Oct '61 in Richmond, VA.
George C Emerson, Pvt, Co B, 2nd NH Inf. Stephen Dearborn, Cpl, Co H, 3rd NH Inf. Killed on 16 June 1862 at Secessionville, SC. Edmund Harris, Cpl, Co I, 11th NH Inf. Killed on 13 Dec 1862 at Fredericksburg, VA.
David R Daniels, Pvt, Co A, 3rd NH Inf. 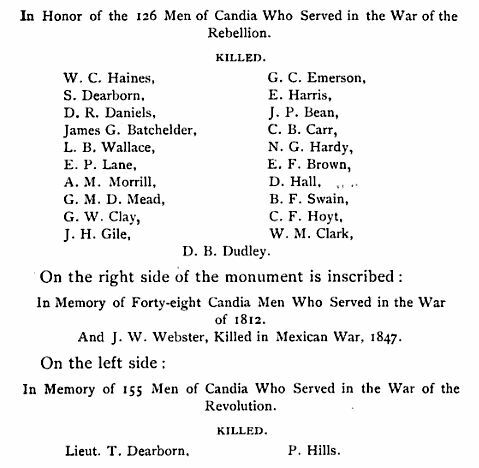 Killed on 18 July 1863 at Fort Wagner, SC. Joel P Bean, Pvt, Co I, 11th NH Inf. Wounded and taken prisoner at Poplar Springs Church, VA on 30 Sept 1864. He died from his wounds while a POW in Salisbury, NC, on 15 Dec '64. David B Dudley, Sgt, Co K, 1st Minn Inf. Severely wounded on 17 Sept 1862 at Sharpsburg (or Antietam), MD, and died on 6 Oct at Frederick City, MD. James G Batchelder, Pvt, Co B, 7th NH Inf. Charles B Carr, Pvt, Co F, 9th NH Inf. Died of disease on 16 Oct 1862 at Pleasant Valley, MD. Llewellyn B Wallace, Pvt, Co I, 11th NH Inf. Died of disease on 11 Jan 1863 at Falmouth, VA.
Nathaniel G Hardy, Pvt, Co D, 10th NH Inf. Died of disease on 21 Jan 1863 at Falmouth, VA.
Edward P Lane, Mus, Co D, 10th NH Inf. Died of disease on 10 Feb 1863 at Carrollton, LA. Edward F Brown, Pvt, Co I, 11th NH Inf. Died of disease on 9 Mar 1863 at Newport News, VA.
Albert M Morrill, Pvt, Co I, 11th NH Inf. Died of disease on 16 Mar 1863 at Candia, NH. Daniel Hall, Pvt, Co D, 15th NH Inf. Died of sunstroke on 7 Jul 1863 at Port Hudson, LA. George M D Mead, Pvt, Co K, 15th NH Inf. Died 15 Aug 1863 at Memphis, TN. Charles W Hoyt (listed as C F on monument), Pvt, Co G, 2nd NH Inf. Died of disease on 14 Aug 1863 at Point Lookout, MD. George W Clay, Pvt, Co I, 2nd NH Inf. Died on 2 Apr 1864 at Candia, NH. William M Clark, 168th Co, VRC (prev in 11th NH Inf). Died of disease on 10 Nov 1864 at Concord, NH. John H Gile, Pvt, Co I, 11th NH Inf. Died 1 Apr 1865 at Manchester, NH. J Moor - perhaps the John Moore, landsman, US Navy. Disch on 4 Nov '64 from hospital at Norfolk.